Long ago before the modern animal rights movement began in 1975, with the publication of Peter Singer’s book "Animal Liberation", Islam demanded kindness to animals. 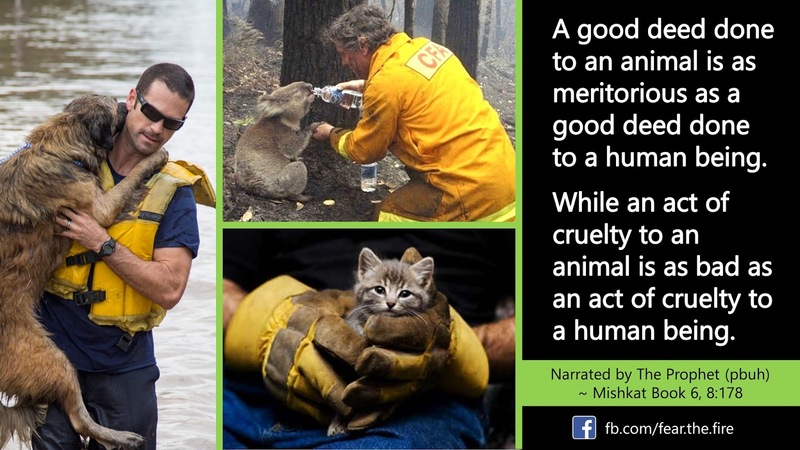 It also warned that cruelty to animals will be a sufficient reason for a person to be thrown into the Hell Fire! The Quran and guidance from Prophet Muhammad (pbuh) gives many examples and directives about how Muslims should treat animals. Islam prohibits cruelty to animals and considers mistreating animals a grave sin. Thus Islam commands Muslims to protect animals and treat them with respect. A famous companion of The Prophet was given the name Abu Hurairah. The name Abu Hurairah means 'father of the cats'. Abu Hurairah was given this name because wherever he went he always had a kitten with him. 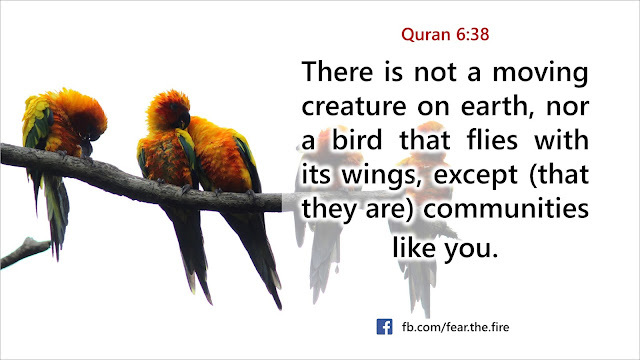 Thus Quran makes it clear that even animals glorify Allah; but we are not capable to understand their glorification. See the detailed article here. 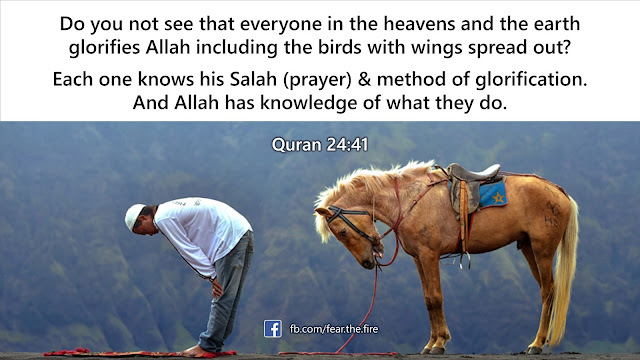 With that we can infer that animals can be called as Muslims as they believe in Allah and glorify Him. Given their submission it becomes extremely important to treat every animate being with care and respect. 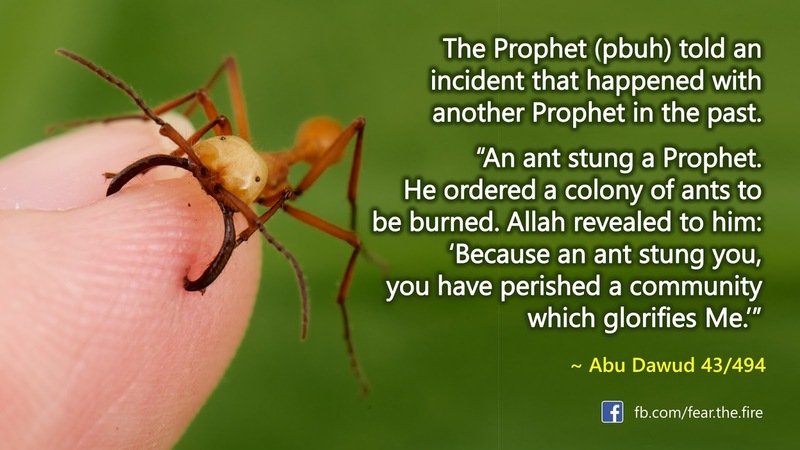 The Prophet (pbuh) narrated an incident that happened to another Prophet in the past. 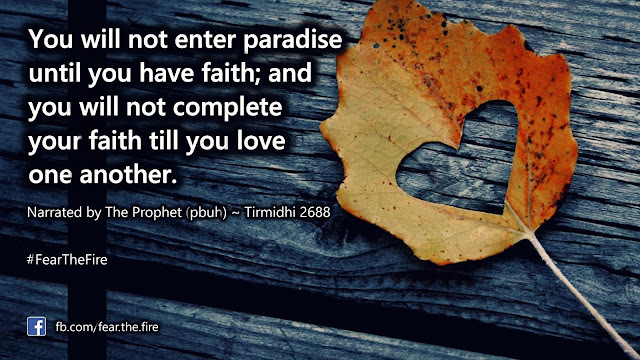 The Prophet (pbuh) often chastised his Companions who mistreated animals, and spoke to them about the need for mercy and kindness. There are several examples of hadith which instruct Muslims on how to treat animals. Here's one authentic Hadith where The Prophet (pbuh) narrated how Allah was pleased with a person and forgave him because he fetched a thirsty dog with water. 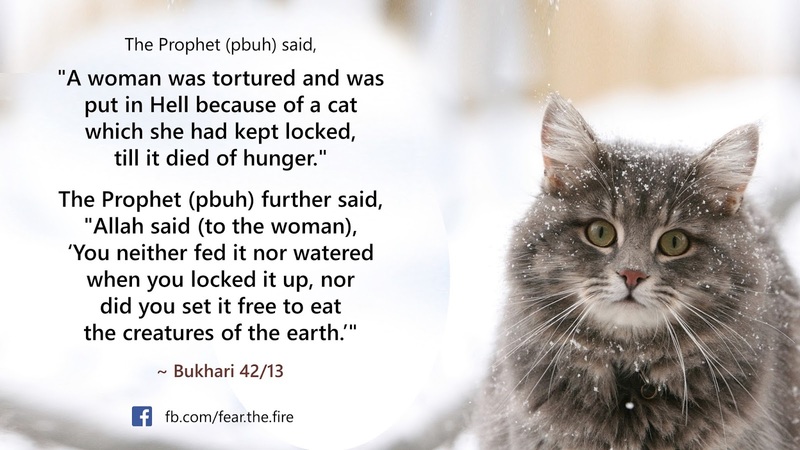 On another occasion, The Prophet (pbuh) described Allah's punishment on a woman who was sent to Hell because of a cat. 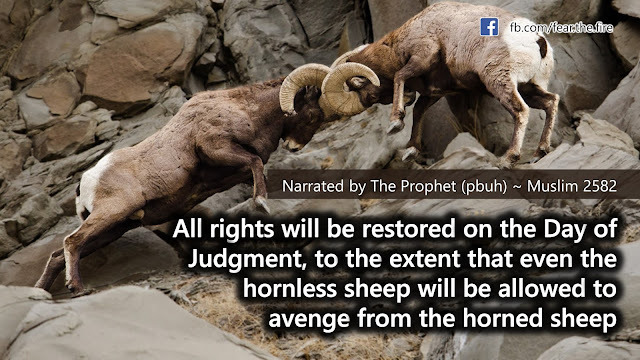 Umar (ra), one of the close companions of The Prophet (pbuh) and the second rightly guided Khalifah of Muslims disliked making animals fight against each other. That's because the fight results in harm to the animal, and it may lead to it being killed for no legitimate purpose. 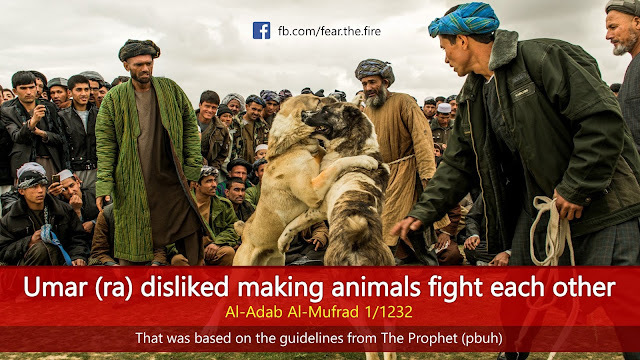 One of the reports suggests The Prophet (pbuh) forbade setting animals to fight against one another. 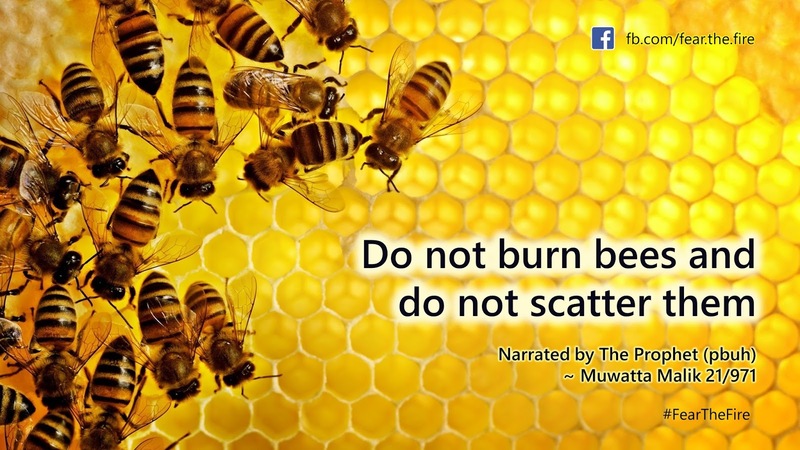 In few narrations The Prophet (pbuh) ordered that bees should not be killed or burnt. We know bees pollinate majority of our crops. Today researchers suggests that fewer bees will cause food supply to shrink and their extermination could set off a global food crisis. In the last few years several articles were published on why bee conservation is important. See BBC video here. Trading dogs or cats for money: Selling a dog or a cat for money is forbidden. 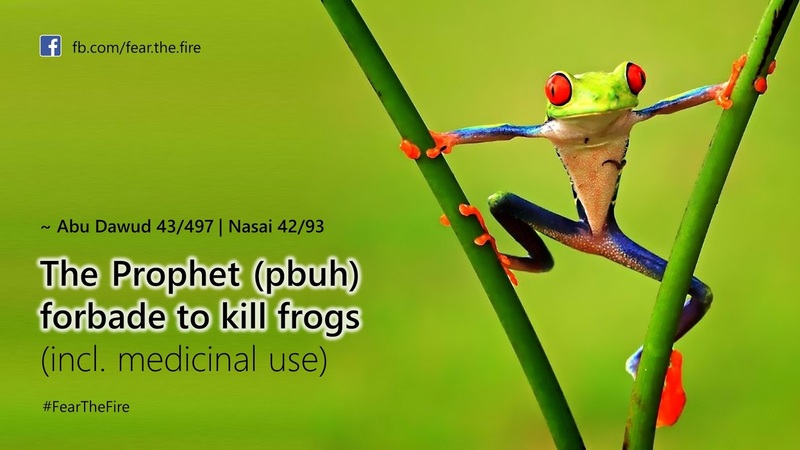 It is not permissible to sell cats, monkeys or dogs, or any other carnivores that have fangs, because the Prophet (pbuh) forbade that and discouraged it. 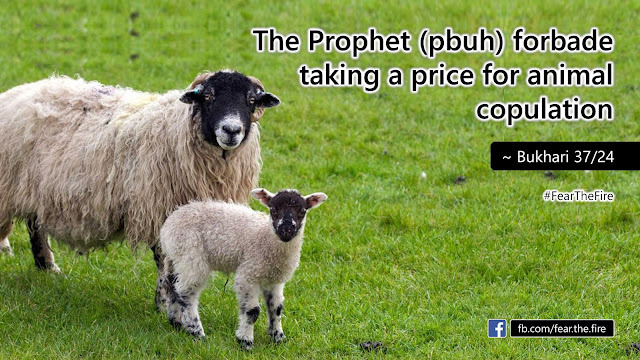 In another narration The Prophet (pbuh) forbade taking a price for animal copulation. ~ Bukhari 37/24. 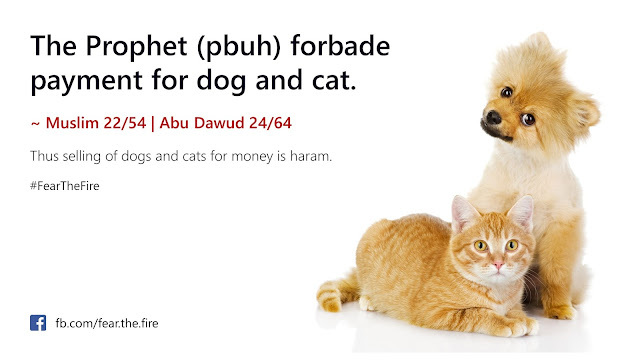 Doing business for monetary gain by the means of copulation or by selling cats and dogs is forbidden in Islam. Then Why Do Muslims Kill Animals for Food? Meat-eating is not mandatory in Islam. It is perfectly fine if a Muslim chooses to be a vegetarian! Islam strictly prohibits killing of animals/birds for sports and leisure. Similarly unnecessary destruction of trees and plants is also disliked by the Sharia. 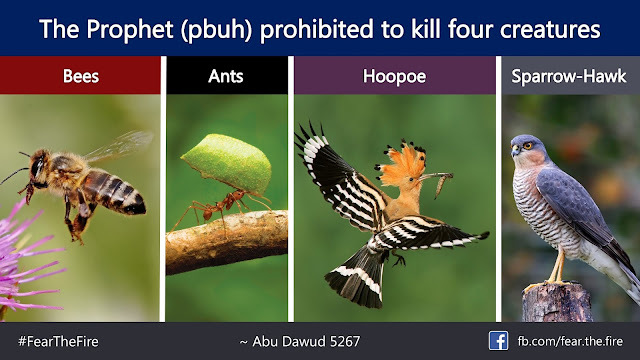 Killing an animal which is not for food is forbidden. Animals who are raised for sacrifice must be treated well. Before sacrifice they are to be fed with water. 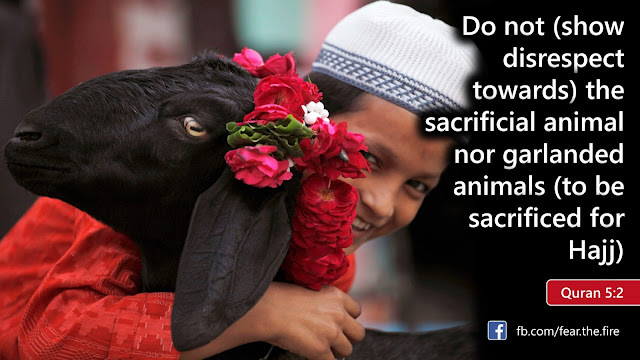 Animals must not see other animals being sacrificed. The knife must be sharp but it must not be sharpened in the animal's presence. The whole neck is not slit but only part of it. The spine is not cut until the animal bleeds out. Muslims must call out Allah's name before slaughtering an animal. So the point here is to demonstrate to people that rights will not be neglected, rather the rights of the oppressed will be settled at the expense of the oppressor. An oppressor can be a tyrant ruler or a community leader or anyone for that matter. They will not be under the shade of Allah in Qiyamah. Thus Islam expressly lays down rights for animals entitling them to the right of love and mercy. Cruelty to animals in Islam is treated with grave contempt and the harshest of penalties, the fire of hell is accorded any individual whoever dares to be cruel to animals. Through these rules and regulations legislated in regards to animals, the Muslims gains the respect and understanding that other creatures are not to be used and abused as one wills, but that they, like humans, have rights which must be given in order to ensure that the justice and mercy of Islam be met to all which inhabit this earth. 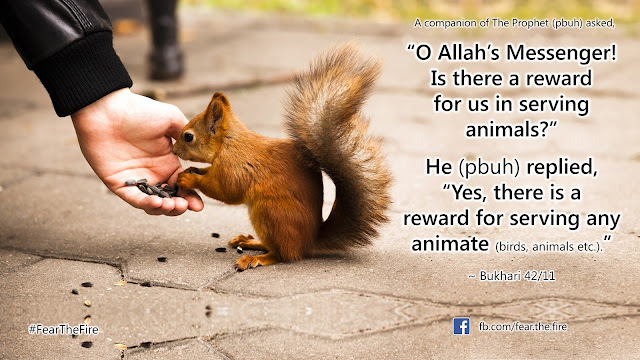 So whoever harms an animal has to repent to Allah for that, because The Almighty who created the animals is the one Who has commanded us to be kind towards them, unless they are harmful.